Fraktur may look like a non-English version of the word fracture, but a Fraktur has nothing to do with breakage. It's both a style of lettering and a highly artistic and elaborate illuminated piece of folk art. Frakturs were originally created by the Pennsylvania Dutch and most examples were made between 1740 and 1860. They were drawings, executed in ink and/or watercolors, and were found in a variety of forms: writing samples, birth and baptismal certificates, marriage and house blessings, and floral and figurative scenes. Many were quite beautiful. The earlier Frakturs were done entirely by hand, but printed text became increasingly common in later examples. 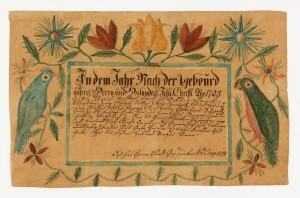 Common artistic motifs in Fraktur included birds, hearts and tulips, plus blackletter and italic calligraphy. 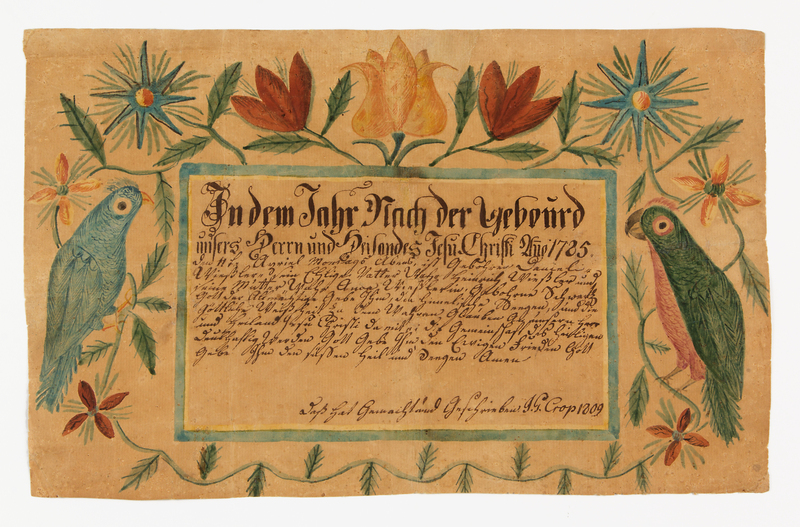 The Fraktur shown here came from the highly Germanic Shenandoah Valley of Virginia, in Rockingham County. It sold for $25,740 at an auction held June 18, 2016 by Jeffrey S. Evans & Associates in Mount Crawford, Va. Important Frakturs have been sold by major American auction houses and antique dealers for more than $100,000.